High eye pressure does not necessarily indicate you have glaucoma. 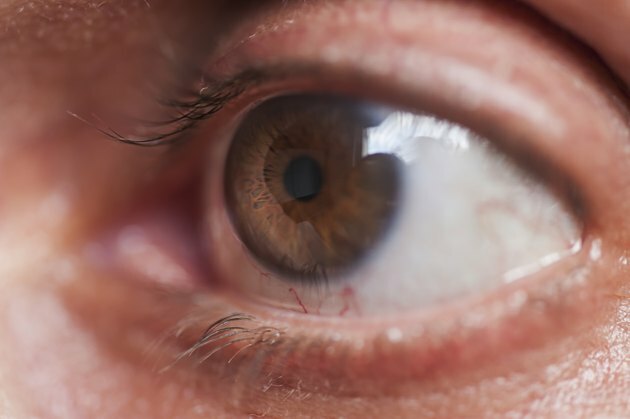 Doctors diagnose this eye disease when you have a high pressure that damages the optic nerve, the structure of nerve fibers at the back of your eye. This damage might lead to loss of side vision, but the process often takes many years before you will notice the change. Eyedrops and other treatments can help reduce intraocular pressure, but researchers continue to evaluate natural substances such as L-arginine for glaucoma control. Aqueous humor, a clear fluid, fills the front section of your eye, and this fluid delivers nutrients to the internal structures of this part of your eye. The fluid also helps the front of your eye maintain its shape. Your eye pressure stems from the balance of aqueous humor flowing into the front chamber of your eye and the aqueous draining out. If the drainage process does not work at the same rate the aqueous enters your eye, you might develop high pressure. The high pressure will push against other structures in the eye, including the vitreous, the jelly-like substance that fills the back of the eye. High pressure will cause the vitreous to press against the blood vessels that feed the optic nerve. This process reduces the amount of blood that reaches the nerve, damaging the nerve fibers. L-arginine is an amino acid your body needs for specific processes such as removing toxins from your body. This essential amino acid helps make other amino acids, such as creatine, which you need for additional body processes. L-arginine turns into nitric oxide in your bloodstream, and the presence of nitric oxide in your blood might help your vessels relax, an event called vasodilation, which widens blood vessels and improves blood flow. In relation to glaucoma, L-arginine shows potential benefits for glaucoma patients. In 2002, researchers in Finland evaluated L-arginine, as well as nitric oxide because L-arginine changes into this compound. Researchers examined the role of these components in reducing eye pressure, and the findings showed that glaucoma patients given doses of L-arginine-nitric oxide had a drop in eye pressure. However, the researchers concluded that the reduction most likely stemmed from the use of glaucoma medications also used in the study, and the researchers did not recommend further evaluation of L-arginine. In 2007, Austrian researchers also studied the L-arginine and nitric oxide component, not for the effect on eye pressure, but on the rate of blood flow that reaches the optic nerve. The study found that the nitric oxide created from L-arginine improved the rate of blood reaching the nerve, showing promise in reducing the risk of nerve damage. Continued research will help determine the exact effects, but as of 2011, L-arginine is not a recognized treatment or method of prevention for optic nerve damage. If you have glaucoma, you must use your medications as directed. Stopping treatment will increase your eye pressure, and you might experience further damage to your optic nerve. Do not take high doses of L-arginine or other supplements without first consulting your doctor because high doses could cause side effects or interfere with other medical treatments or conditions. Does Caffeine Cause Blurred Vision? Are There Natural Herbs to Help Restore Optic Nerve Damage? What Are the Causes of Floaters After Laser Eye Treatment?